In this part of our Web Scraping – Beginners Guide series we’ll show you how to navigate web pages and parse and extract data from them. Let’s continue from where we left off in the previous post – Beginners guide to Web Scraping: Part 2 – Build a web scraper for Reddit using Python and BeautifulSoup. If you are new to this series, we recommend that you start from What is web scraping: Part 1 – Beginner’s guide. Reddit(old.reddit.com) is used here as it is a popular website. If you are looking for reddit data use the reddit API instead. Now that we have extracted titles and URLs to the top links let’s go further. Instead of grabbing the title and URL of each link, we’ll go to the comments page for each link. Like before, right click on any comments link and choose Inspect Element. Chrome developer toolbar should popup highlighting the a<a><span></span><span></span><span></span><span></span> tag that contains the URL to the comments page. You can see that they have a class attribute class='bylink comments may-blank'. But before we decide, let’s make sure the a tags to comments for the other links also have the same class. If all the comment links don’t have at least a common class, we need to think of another attribute to use for selecting these tags. Fortunately, in this case, all the comments links have three common classes – bylink, comments, and may-blank. Let’s modify the code from the previous scraper. We are removing everything after isolating the div called siteTable. Now that we have all the a tags with comment links, let’s go ahead and extract the href attribute from them. There are some absolute links and some relative links among the values. So lets clean them by prepending https://www.reddit.com/ before the URL to make them valid. We’ve extracted and cleaned the URLs to the comments page. Before we go into downloading all the URLs, let’s make a function to extract data from each page. We’ll first download one comment page – https://www.reddit.com/r/worldnews/comments/7ug4pb/cancer_vaccine_eliminates_tumors_in_mice_90_of_90/, extract the data from it and then turn it into a function. To find where each field we need in the HTML is, let’s do what we always do – right click the detail and inspect the element. Let’s download and get the HTML body for one URL first. We will later add this into the for loop above. a class="title may-blank outbound" data-event-action="title" href="https://med.stanford.edu/news/all-news/2018/01/cancer-vaccine-eliminates-tumors-in-mice.html"
tumors in mice - 90 of 90 mice cured of cancers with lymphoma, similar results observed in colon, breast, and melanoma cancers. It looks like we can use the class attribute to select this like before. You could also use the data-event-action attribute to get the title. Let’s check if there are multiple elements that match the selector we have used. Ideally, we need the selector to match only one element – the one we need to extract. The find method of BeautifulSoup takes the first element that matches the selector. So the selection criteria we choose must be unique to the element (preferred) or should be the first match. The find_all method of BeautifulSoup selects all the elements that match the selection criteria. We had used find_all to get the a elements that had links to the comments page above. Let’s take a look at each of these functions and what elements it would return if we only used class for getting the title. Looks like there aren’t any other a tags which have class as title. Let’s check if there are any tags other than an a tag with the same class. We will leave the name argument or the first parameter blank, so that it will match all tags – not just a tags. There we go – 9 elements have title as a class attribute. We are lucky that there is only one a tag in it. The reason we showed this is to reinforce that you should always try to define a unique selection criteria, that will not match anything other than what we are looking for. Now that we have shown in detail how to extract the title, we’ll get few other fields without explaining a lot. It’s easy to figure out. Reddit seems to display 3 divs. One for a person who has downvoted in the div with `<div class=”score dislikes” title=”88324″>88.3k</div>` , for a person who hasn’t voted – `<div class=”score unvoted” title=”88325″>88.3k</div>` and for the upvoter `<div class=”score likes” title=”88326″>88.3k</div>`. Since our scraper doesn’t plan to login or upvote, we fall into the second category – the unvoted. So let’s pick that as our selector. We can look for `div` with `class` as `score unvoted` and get the text from it. First let’s verify if there are multiple matches for our criteria. Now you might be tempted to use the classes as is for the selection criteria. id-t2_as4uv looks like a randomly generated value. 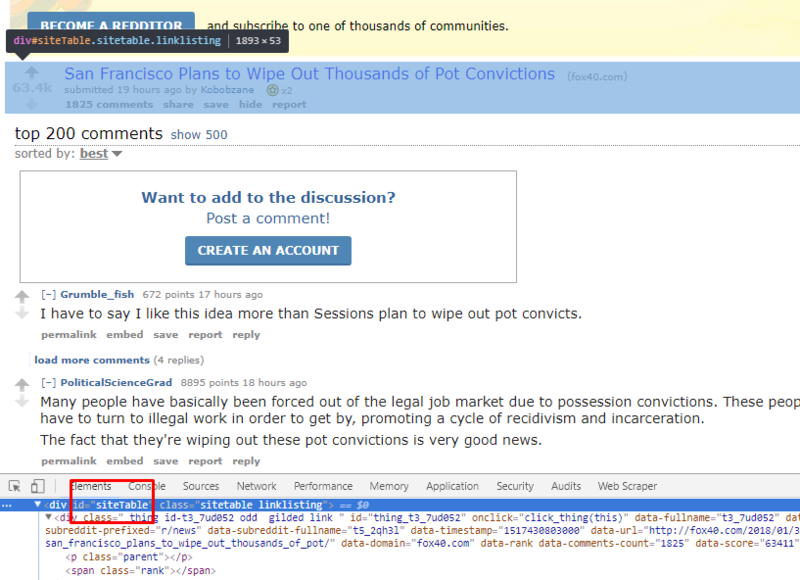 Let’s go to another comments page ( https://www.reddit.com/r/news/comments/7ud052/san_francisco_plans_to_wipe_out_thousands_of_pot/ ) and see if the classes remain the same. Nope, it does. The id-t2_ has another random value. Let’s try selecting &lt;a&gt; tags with author as a class. First, let’s check for multiple matches. len() tells you how many items are present in the list. There are 209 – Not a unique selection criteria. Our current criteria selects every username present in the page, we just need the one of the person who submitted the link. This calls for more isolation. Let’s go a few levels above the a tag and find a way to isolate this a from the rest. All of the details for the link is enclosed in a div with an ID siteTable. Let’s go ahead and grab it, then extract the rest from the isolated HTML. Let’s check if there are multiple matches here as well. Note that we are using main_post instead of soup here. We isolated the HTML into main_post and we only need to look inside it. Great. Just one. We might as well modify the other fields above to just look inside the main_post. We have so many comments, and then there are details we need to extract from each comment. Lets first isolate the comments section to prevent matches with the main post. They are in a div with class as commentarea. Let’s find all comments. If you inspect a single comment and move a few tags upwards, you can see that each comment is in a dive with classes entry unvoted. We can use the same to grab and isolate each comment. Alright, we have grabbed 379 comments. You can print the variable to see each of them. Lets loop through each comment, extract the commenter, comment text and the permalink to the comment. We’ll skip the inspection and selection as we have been over it for a while. Now that’s bad. Let’s find out why we got this error. Print the comment variable and look at the HTML. The only field left is the permalink of the post, which we will get directly from the URL in the response object. We’ll make a function that receives a comment page URL as an input and then extract the data from it, and finally return a dict with the data. #We are now looking for any element with a class of author in the comment, instead of just looking for a tags. So our parser for the comments page is ready. Let’s get back to navigating. Let’s call this function in the for loop we used to pull the comment page URL. For now, we’ll stick to extracting data from 10 links. #Lets wait for 5 seconds before we make requests, so that we don't get blocked while scraping. #if you see errors that say HTTPError: HTTP Error 429: Too Many Requests , increase this value by 1 second, till you get the data. The data is quite large, let’s just look at one record we extracted. If you see errors that say HTTPError: HTTP Error 429: Too Many Requests it is because the website has detected you were making many requests or have identified the script as a bot. You can read more on how to prevent getting blocked while scraping here. This scraper is still incomplete. It can’t save data to a file yet. We will leave that as an exercise to the reader. You can read more about writing files to JSON here https://www.safaribooksonline.com/library/view/python-cookbook-3rd/9781449357337/In the next part of this tutorial, we will show you how to use a web scraping framework to build a complete scraper that can scale up locally, save data to files, start, stop and resume execution etc. Pretty same comment as Part 2, appreciate the effort and examples. But due to reddit’s popularity these guides are deprecated and require some updates either using PRAW wrapper, old.reddit rather than reddit.com, and including information about user agents to avoid error 429 (requesting overloading). We will get these updated as soon as possible. Go through your tutorials meticulously. Got the result for the example was page i.e reddit.com. but when i want to use the same method in other site i am not able to find out the targeted main table or container and its element. pleas e help me finding the css element in my targeted web address which (https://www.amazon.in/digital-slr-cameras/b/ref=sd_allcat_sbc_tvelec_dslr?ie=UTF8&node=1389177031) where i wanna to list out the best DSR camera details. I’m not clear what’s being typed into the command line and what’s being typed into the file.